The Genesis STAAGE lift comes fully assembled and ready to use. It is the perfect accessibility solution for stages up to 1143mm (45") high. 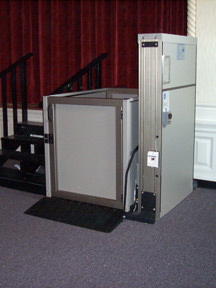 The three wheel portable system is easy to use and does not require to be removed to use the lift. The adjustable upper landing limit can be set in a matter of seconds. 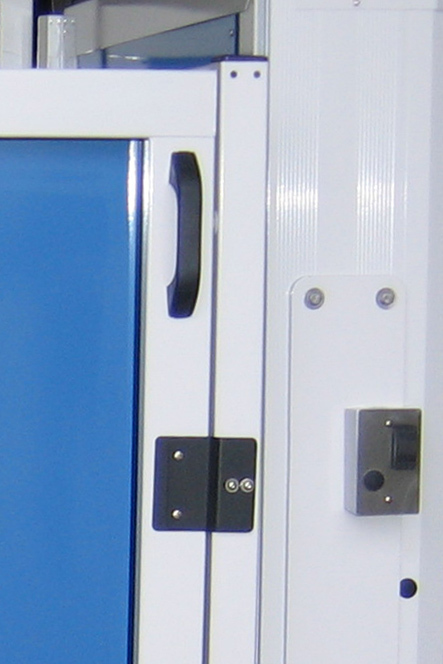 The lower landing call station is equipped with a lockout key switch to prevent unauthorized use of the lift. The STAAGE is equipped with many standard safety features and is built to the same quality standards as all of Garaventa Lift's world class public accessibility lifts. The Directional Control Switch is mounted to the sidewall of the platform. Pushing the upper or lower ends of the Direction Control Switch moves the platform in the corresponding direction. The platform will automatically stop and when the switch is released. The Emergency Stop/Alarm button is also located on the platform sidewall and can be pressed at anytime to stop the platform. An alarm will sound when the button is pressed. When the platform is not at the lower landing the ramp is in the raised position. As the platform descends to the lower landing the ramp automatically opens. Five heavy-duty sensing switches are located on the underside of the platform. These switches will automatically stop the platform should it encounter an obstacle during downward travel. When the safety pan is obstructed, travel in the upward direction is not disabled allowing the platform to move away from the obstruction. The electro-mechanical gate interlocks prevent the platform from operating unless the gate is fully closed. The gate automatically locks when the platform leaves landing. The lower landing platform gate is an optional feature and not supplied standard. The Grabrail is located on the platform side panel. The steel panels and framework are finished with electro statically applied baked fine textured Satin Grey paint. The panels, gates and mast are framed with champagne anodized aluminum extrusions. Optional finishes are available. A hand wheel provided with the lift and is used to manually move the platform to the desired landing in case of a power outage.